gone from the dunes at Cape May Point. It's starting to look like winter. It's Saturday, November 1, and the two-month field season for the Monarch Monitoring Project is finished. For the last 61 days we have conducted our driving census several times each day, providing us with a snapshot of how this year's migration compares to previous years. We will analyze these data during the off season, but you can see the raw data on our website here. No monarchs were counted on yesterday's final censuses. This is as it should be, the monarchs need to be further south by the end of October. Many have been seen arriving at the monarch reserves in Mexico in recent days. It's been a terrific field season for our project. Monarch numbers were up from last year. Fundraising success in recent years allowed us to hire two assistants this year, and we offer heartfelt thanks to Lindsey Brendel and Angela Demarse for their great work. We'll miss you here in Cape May and we hope you'll be back soon. The field season is over, but the work of the Monarch Monitoring Project continues throughout the year. Now we must assemble all the data from the field season, send all our tagging data to Monarch Watch, and analyze the results of our field season. Early next year we'll begin preparations for the 2015 field season, we'll work to raise funds for the coming season, and we'll watch for reports of tag recoveries, hoping that a few of the monarchs we tagged this autumn will be found in Mexico or elsewhere along the migratory route. The frequency of posts to our blog will drop dramatically, but we promise to post promptly if we learn of any tag recoveries. Thanks to all who have made contributions to sponsor our project. Thanks to all who have come to our tagging demos or engaged our staff in conversations while we were working in the field. 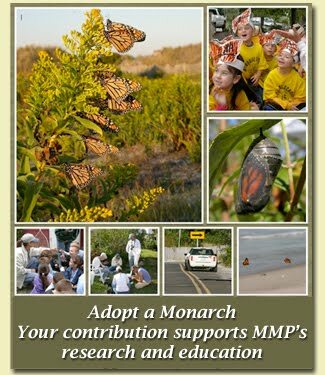 And thanks to all who are working to project these remarkable butterflies, whether planting a butterfly garden, supporting legislation, educating others, and/or visiting the monarch reserves in Mexico. You are all part of our team.